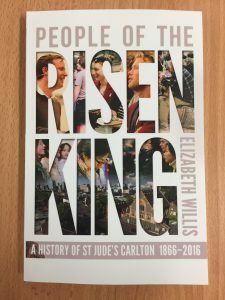 This is a more detailed review of Elizabeth Willis’ history of St Jude’s Anglican Church Carlton Vic Australia. Encouragement and gratitude to God and his faithful servants: it was with these emotions that I closed this skillful interweaving of Church and society through 150 years: St Jude’s Anglican Church in Carlton. Carlton’s socio-economic conditions and demography, clerical and lay personalities, theological emphases, liturgical practice, the Melbourne Diocese, and national and international affairs are colourfully integrated. 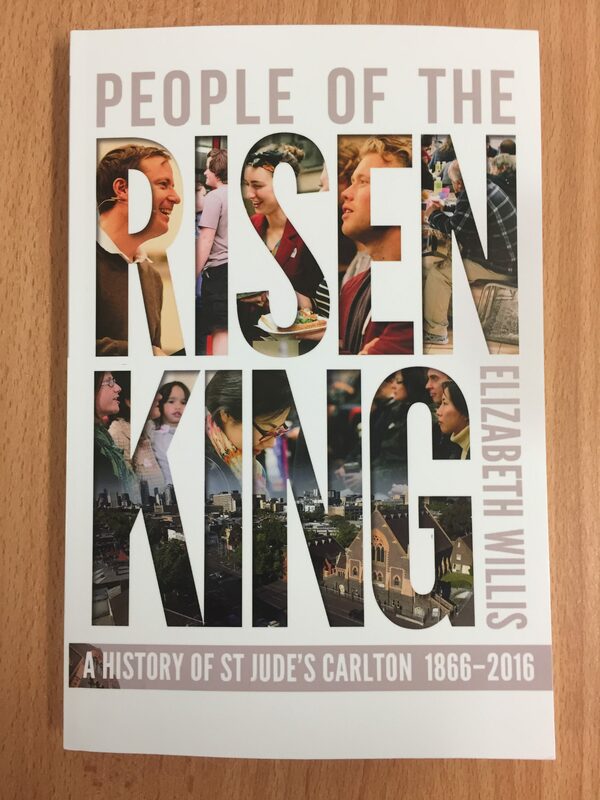 Through testing times, diverse personalities and ever-changing ministries, the life and mission of the ‘People of the Risen King’ at St Jude’s Carlton is brought to life. Carlton ‘larrikins’ blocking the entry of worshippers, the decline in attendance following the First World War, the depression, bulldozing to ‘clear the slums’, the building of Housing Commission estates, the opportunity to welcome ‘New Australians’, university ministry, discipleship training, parish partnerships, new congregations and relations with the Diocese of Melbourne: throughout it all we see the faithfulness of men and women to the work of God. The ethos of the times is well captured. By way of example, the loss of faith following the First World War is highlighted: “subdued and grieving at the end of a horrible war when people were picking up the pieces and trying to make sense of a world where old certainties about progress and security had been shaken” produced stark challenges for the Church. A ‘Come to Church Sunday’ in 1919 seemed to miss the mark when it “exhorted people to go to church because it was a good thing to do, because it was a duty owed to God, and because their mothers would be pleased!”! Anecdotes tell of incidents and characters. Vicar Lance Shilton in the early 1950’s was challenged at his first Women’s Guild meeting, ‘We’ve heard that you don’t believe in gambling. We want a ‘yes’ or ‘no’ answer. Can we have raffles at our fete?’ The Vicar concluded his ‘no’ with, ‘I am confident that by not having raffles at the next fete, you will make more money than you would ever have made before.’ The President replied, quick as a flash, ‘Would you like to bet on that?’ – This reader could not help but laugh! These impacts of changing demographics bring their own demands to parish priorities and possibilities. Hardly imaginable in 1866 would be the translation of sermons into Mandarin and Farsi in 2015! The issue of liturgical changes and their cost to parishioners and clergy is not avoided nor the struggle to settle the ‘culture’ of a congregation and indeed of the parish. Would a congregation’s services have robed clergy, hymns, public prayer, charismatic expression, expository sermons, be family/children friendly, welcoming to the outsider, lay or staff leadership or some combination – and all in ninety to a hundred minutes? Insight is given to the significance of the gifting and emphases of the clerical leadership on the life and ministry of the parish. I appreciated the honesty of the personal challenges faced by clergy and the conflict within the life of the parish. In particular, conflict between staff is named while at the same time holding the tension of naming a conflict without blaming and its associated ‘reveal-all’ narrative. This history is no hagiography – and praise be to God for that! Photos add to the narrative. After viewing the impressive 1905 St Jude’s Football Team, I looked in vain for recent vicars Boan, Adams and Condie in similar football team pose of crossed arms and attired in football shorts and sleeveless footy jumper! A deftly placed photo of a fully robed bishop, robed vicar, two women wardens in smart casuals and a male warden in shorts and thongs, delightfully illustrate the Vicar’s words to the 1988 AGM, “I think that St Jude’s still retains great deal of its off-beat, imaginative and risk-taking style. It is still fun to be part of and, despite the apparent order and sameness of our life, the erratic, the irregular and the very funny still occurs!”! The relationship between St Jude’s and the diocese of Melbourne is honestly traced with its ups and downs – and current healthy state. The irony of writing of the seemingly endless struggle to maintain the parish buildings fit for purpose at the very time it is uninhabitable due to a deliberately lit fire in 2014 is not lost on the author. A multimillion dollar building project is currently underway. Truly a stimulating read! Do leave time for reflection along the way, for this history is a reminder that through the changing circumstances of parish and societal life the Church is the ‘People of the Risen King’. An insightful and inspiring history!